Rewilding seeks to provide connected spaces at landscape scales, that are given the freedom to operate as fully functioning, healthy ecosystems, governed and sustained by natural processes. In order to succeed, it is necessary in some cases to reintroduce those features of an ecosystem that are missing, but that are essential to achieving and maintaining ecosystem balance. The end result being that areas are created where both humans, flora and fauna co-exist and thrive alongside each other. Rewilding is a concept that is now well established in conservation circles. Rewilding has also been brought to the public’s attention via news headlines associated with reintroductions of animals such as the lynx and wolf. Due to their size and requirements for sustaining life, large carnivores are globally under threat from human encroachment and competition for resources. 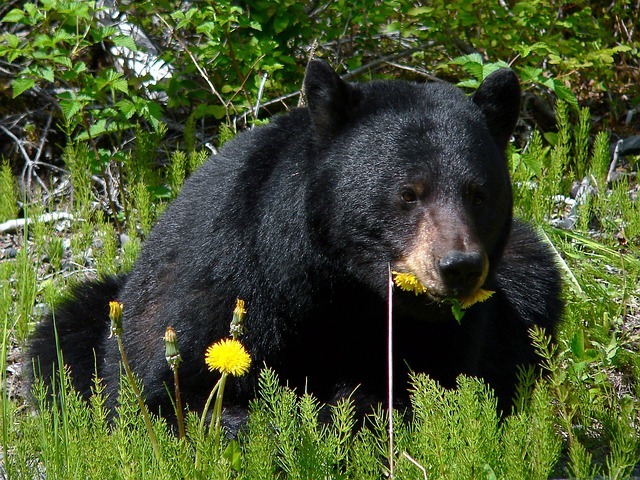 Animals such as bears, wolves and big cats have suffered both targeted and indirect persecution and eradication by humans over sustained periods, through means such as hunting and habitat loss / fragmentation. This has led, in some cases, to species being forced into direct conflict with humans as they try desperately to source the habitat requirements necessary for their survival. The decline in large carnivore presence has had dramatic, and in some cases catastrophic, effects for other plants and animals within ecosystems. Large carnivores, amongst other things, limit the numbers of herbivores, this in turn has effects on plant structure and community. Take the carnivores out of the equation and the whole system loses its’ balance. In some areas, there has been progress towards restoring ecosystem function; Wolf & Ripple note that there are instances where there has been a gradual expansion of large carnivores. When the conditions are right in terms of tolerance, policy and absence / reduction of competition for resources, humans and large predators may be able to coexist; this is illustrated by the natural range expansions of the grey wolf, brown bear and Eurasian lynx in parts of Europe, and of the grey wolf in the USA. A concerted approach towards rewilding is necessary in order to restore ecosystem function, conserve species, habitats and resources. We now have a greater awareness regarding the means by which potential human / animal conflict may be minimised, resulting in an increase in successful reintroductions of large carnivores. This knowledge can be used to support the process of rewilding when extrapolated to other regions. A number of research projects that have looked at factors influencing successful reintroductions were used as a basis for Wolf & Ripple’s work. Factors such as critical reserve size, edge effects, availability of prey, presence of established competitors, and the ecology / life-cycle traits of species were taken into account. This particular research project was motivated by the urgent need to address carnivore decline. 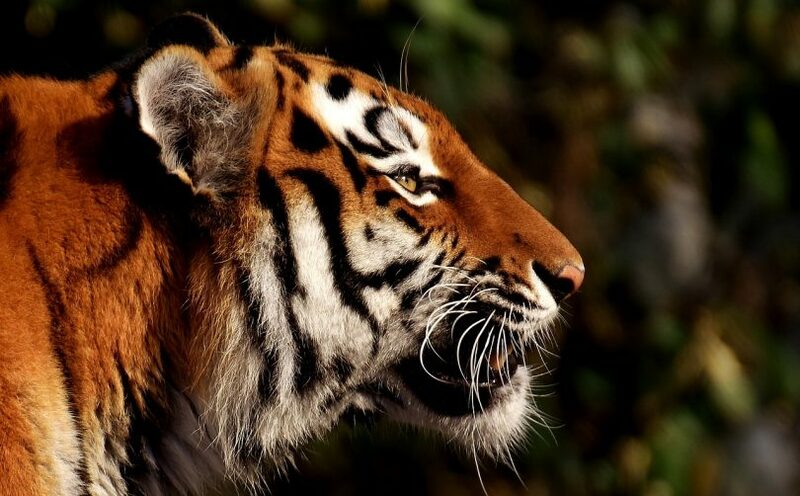 The primary goal being, for each large carnivore species selected for the project (25 in total), to identify specific protected areas and other areas where the likelihood of successful reintroduction may be high, providing data on likely predictors of reintroduction success for each region. Taken as a whole, the analysis serves as a “preliminary, data-driven assessment of global rewilding possibilities”. The 25 terrestrial large carnivore species in the analysis. 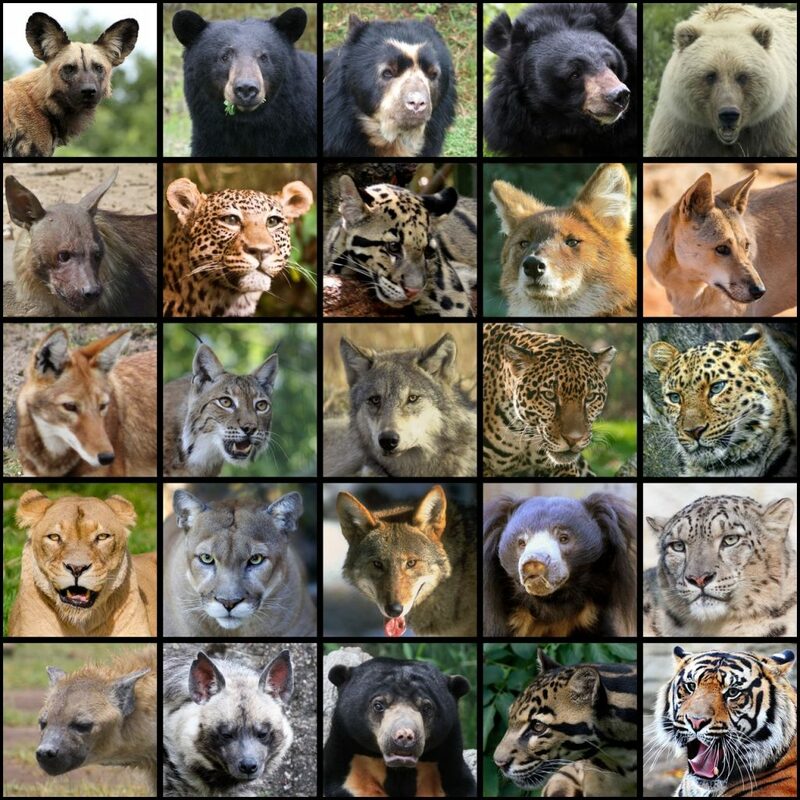 From left to right, the species are: first row—African wild dog, American black bear, Andean black bear, Asiatic black bear, brown bear; second row—brown hyaena, cheetah, clouded leopard, dhole, dingo; third row—Ethiopian wolf, Eurasian lynx, grey wolf, jaguar, leopard; fourth row—lion, puma, red wolf, sloth bear, snow leopard; fifth row—spotted hyaena, striped hyaena, sun bear, Sunda clouded leopard, tiger. (Wolf & Ripple, 2018). The carnivores selected for the research project comprised those where comprehensive information was available regarding their historic and current range. The areas where the species had previously been recorded but were no longer present, comprised the main geographic focus for the consideration of possible reintroductions. The first parallel analysis saw the researchers focus on protected areas that have been issued with the highest level of protection. They mapped where these areas overlapped a species’ previous range, using reserve size as the primary criterion to determine the protected areas best suited for reintroduction, in addition to current carnivore status within the individual reserve. The second strand of analysis looked at the 2009 global human footprint map . This map illustrates the impacts of humans on the environment, based on source data including maps of roads, night-time lights, land cover and human population density. The ‘last of the wild’ methodology was then used to determine large, relatively intact areas within the previous ranges of each large carnivore species (‘Last of the wild’ regions are defined as contiguous regions within a larger region that are in the bottom 10% in terms of human footprint). The researchers’ focused on the largest six regions for each carnivore species to match the protected area analysis that was undertaken. After identifying protected areas and low footprint regions for each large carnivore, Wolf & Ripple conducted parallel analyses using these two datasets to explore where reintroductions may have the greatest likelihood of success. For each large carnivore species, in addition to looking at the geographical area and average human footprint of each area, they determined whether or not the large carnivore guild (set of species) becomes complete (relative to approximately AD 1500) if that carnivore species were to be reintroduced there. The research also determined the country and broad-scale geographical region of the site, and finally, for the hyper carnivore species (large carnivores with diets containing at least 70% meat), where data was available, they reported the preferred prey species, threatened preferred prey species, and estimated total number of preferred prey species available at each site. 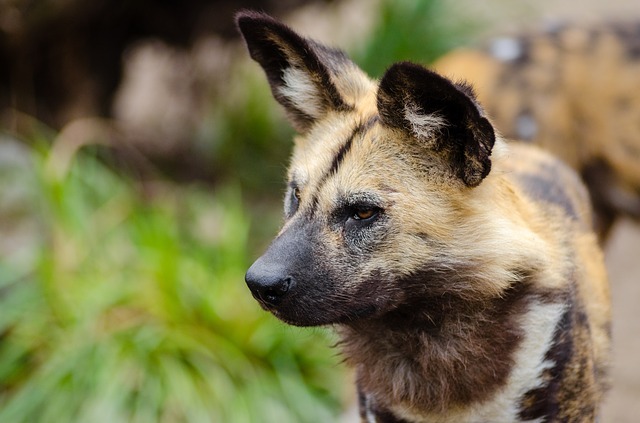 Connectivity of protected areas was also taken into consideration, treating protected areas separated by more than 500km as non-adjacent, which reflects the dispersal distances possible for large carnivores. Six of the largest protected areas were identified for each large carnivore species (except the red wolf—only three protected areas were identified for this species) where reintroduction may be successful following the implementation of conservation programmes designed to limit ongoing threats to carnivores, possibly including the original causes of extirpation. These form a set of 130 different protected areas globally, covering all major regions of the world. The protected areas span 48 countries, and most commonly occur in Mongolia, Canada, Thailand, Namibia, Indonesia and Australia. Of the 147 protected area–large carnivore combinations (six for each species except the red wolf), 59 (40.1%) would result in an intact carnivore guild following reintroduction of the large carnivore. The research identified the six largest low footprint regions for each large carnivore. These form a set of 150 regions and as with the protected areas, these low footprint regions cover all the major regions of the world. The regions cover 40 countries, most commonly occurring in the USA, Russia, Canada, China and Mauritania. Of the 150 region–large carnivore combinations, 22 (14.7%) would result in an intact carnivore guild following reintroduction of the large carnivore species. In terms of corridor availability, large groups of connected protected areas were observed in much of the world, with regions of particularly high concentration including Mongolia, Central and Southern Africa and Canada. It is clear that whilst suitable areas have been identified for large carnivore reintroductions, the practical application of reintroductions is dependant on ground-truthing individual factors and needs to be assessed on a case-by-case basis. For example, protected areas in some instances, still have high incidents of hunting and poaching, which could undermine the success of any reintroductions through targeting of the introduced species or their prey. Findings of relatively high (≥10.0) average human footprint in protected areas for the Eurasian lynx, sloth bear and Asiatic black bear suggests that this may be a particularly serious issue for these species, although recent large carnivore recoveries in Europe indicate that carnivore persistence in heavily modified landscapes is possible in certain cases provided that prey are abundant and persecution is limited. Areas that have been identified as low footprint regions could be subject to other pressures that render them less suitable for reintroductions such as mineral extractions / industry, political instability and effects of climate change. Whilst there are limitations to the study, (e.g. uncertainty with regards to data reliance that underpins the research and on-the-ground practicalities), this research acts as an important first step in identifying much needed areas for future large carnivore rewilding across their former range. Wolf, C. & Ripple, W.J. 2018. Rewilding the world’s large carnivores. R. Soc. open sci. 2018 5 172235; DOI: 10.1098/rsos.172235. Published 14 March 2018. Venter O et al. 2016. Sixteen years of change in the global terrestrial human footprint and implications for biodiversity conservation. Nat. Commun. 7, 12558. Research findings re-published under the terms of the Creative Commons Attribution License.